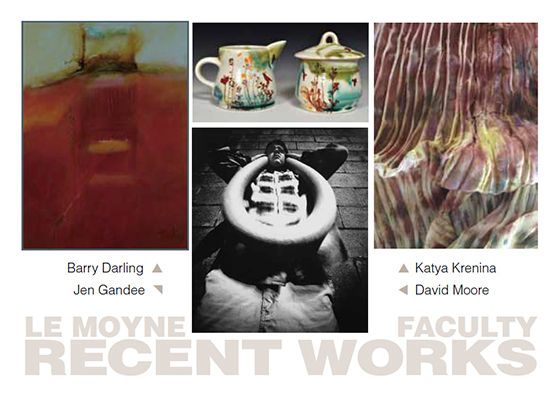 An exhibit of recent work by Le Moyne faculty members will open the 2014-15 schedule of exhibits at the Wilson Art Gallery in the Noreen Reale Falcone Library on the Le Moyne campus. The exhibit features the work of Barry Darling, Jen Gandee, Katya Krenina and David Moore, all members of Le Moyne's visual and performing arts department. They work in a wide range of media and styles -- paintings, drawings, photography and sculpture; expressionism, symbolism, narrative, and realism. The exhibit opens on Friday, September 5, and will run through Friday, October 3, and can be seen during regular library hours. An opening reception will be held in the Wilson Art Gallery on Friday, September 5, from 4 - 6 p.m. The event is free and open to the public. For more information, call (315) 445-4153. Katya Krenina has a passion for book illustration, and for translating the written word into images. She is influenced by her Eastern European roots and feels a strong connection to folk art and storytelling traditions. She has published more than 15 books, which have won national and international awards, and has exhibited her work across the country and abroad. David Moore received a Master of Fine Arts from Syracuse University. He has exhibited his work in galleries and cultural centers both regionally and nationally, and is a recipient of the 2007 Light Work Grant from Light Work in Syracuse, N.Y. His photography books, “False Idols” and “Ephemeral Beings” are in the collections of museums and galleries throughout the United States. Jen Gandee is a ceramic artist and graduate of the Syracuse University School of Art and Design. Her work explores the place where art and craft collide, combining recreated historical forms and reinterpreted traditional patterns and techniques with found objects and appropriated modern imagery. Barry Darling’s primary medium is painting, and his works are included in numerous private and corporate collections. He holds a Master of Fine Arts degree from Louisiana University. His teaching experience includes 28 years as director of the art department at Henninger High School in Syracuse, N.Y. Darling exhibits widely throughout the U.S. and is currently represented by Adieb Khadoure Fine Arts in Santa Fe, N.M. His painting studio is in Tully, N.Y.